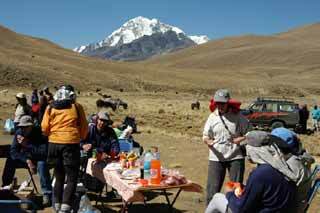 This is Wally Berg calling from Huayna Potosi Base Camp. The 21st of June was our first big alpine climbing day of the trip, what we’d been dreaming about and building up to with our acclimatizing and training. A good group of us weren’t feeling fit enough to go up on the glacier and decided to trek up towards Zonga Pass and spend the day hiking rather than climbing. It was a beautiful trip and everyone came back from that excursion full of great stories, including the sighting of one of the giant condors this part of the Andes is famous for. The people who went up for the climbs were basically in two groups: Myself with Doc Martin and Deke, we climbed Tarija, which is a 5350 m glaciated peak, quite a technical glacier climb and like nothing Doc and Deke had ever done before, but they did great. We sat on the summit on a beautiful, clear day in the Andes. I ought to mention the snow storm we had the day before was gone and we were back to our blue bird crystal clear days here on the trip. The big climb of the day was completed on Pequeño Alpamayo. Alex, Dafna, Woodie and Leila on a rope lead by Dave Scott and using fixed lines that were set up by Bernardo and his climbing staff, stood on the summit of Pequeño Alpamayo about 1 pm. It was a stunning and aesthetically spectacular technical climb. They were exhausted when they got back to camp but it was inspirational for the rest of us for the quality of the climbing we can have in Bolivia. We’re proud of their accomplishment. 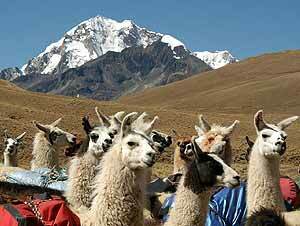 On the 22nd, we trekked back out to Tuni where we met a colorful group of llamas. We enjoyed a buffet lunch, got back in the bus and we drove around back towards La Paz, but not all the way into La Paz. A group of us are now at Huayna Potosi base camp and, in the next day and a half, we’ll be attempting to climb it. I’ll give you a report as we attempt to work our way up for the high point of the trip. I ought to mention that the trekking portion of the trip is underway and, under the leadership of Leila, is back in La Paz today and that’s Becky, Charlie Martin, Deke, David and Gail. The rest of us, Dennis, Woodie, Alex, Jack Maxwell, Matt and Sue Zanner and Dafna, are at Huayna Potosi base camp and we’re moving to high camp on the 23rd of June for a short and hopefully a restful night’s sleep up on the glacier before we attempt to climb Huayna Potosi on the 24th. We’ll give you a report from high camp and above as we climb up. As I said before, the blue skies have returned to Bolivia. People are fit and enjoying the trekking and the climbing portions of the trip. This is the heart of what we are doing. We are looking forward to the next couple of days as we climb this mountain and get mountain to drop down into the Yungas for the final part of our trip in the jungle.